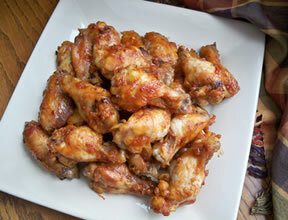 Sweet glazed wings with a little boost of flavor from the chili sauce and red pepper flakes. 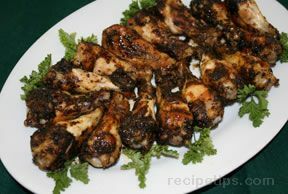 The combination of ingredients provides a great savory-sweet flavor. Cut wings into sections. In plastic bag, combine remaining ingredients. Reserve 1 C for basting and refrigerate. Add wings to bag, turn to coat. Seal bag and refrigerate for 4 hours. Grill the chicken covered over medium heat for 16 minutes, basting and turning several times, grill uncovered 8 minutes. 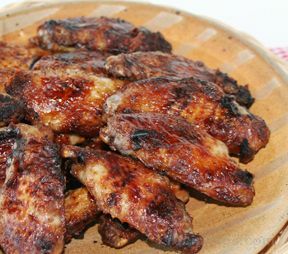 The wings may be baked in a 375° oven for 30 - 40 minutes. "Fantastic wings. I made them to take to a Super Bowl party. They were a big hit. My husband would have liked them with a little more heat but there were going to be little kids there and I didn't want them too spiced up for them. 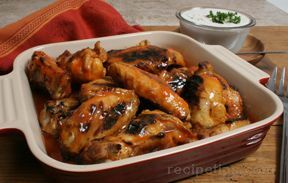 Otherwise you could add more red pepper flakes or a little hot sauce to turn up the heat."